It’s my pleasure to welcome the third of my guests, talking to me about the eight books that they’d salvage from their collections if they had to leave home in a hurry. And this time, it’s the turn of Tamar Hela. Tamar very kindly interviewed me over on her blog at tamarhela.wordpress.com so I was pleased to be able to return the favour and invite her onto my blog. As with all of my interviewees so far, Tamar has been writing since an early age, ten in her case. That’s nearly twenty years, she tells me and she’s been doing so professionally now for the last four years. So what has she completed thus far? “I have written all kinds of things,” she says. “I’ve written poems and have had one published. 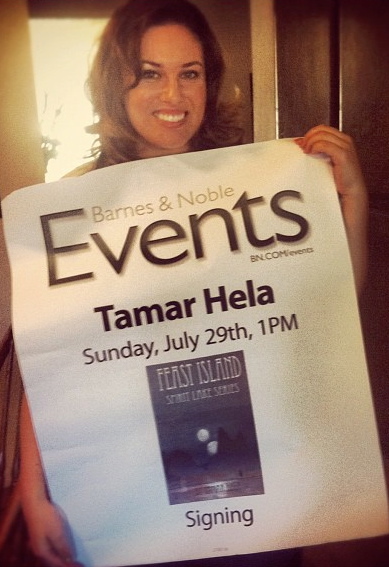 I have also written a young adult novel, Feast Island, which came out last year and is about to be re-released this month. I also blog on a personal blog and write health articles at examiner.com.” Tamar gained valuable writing experience while working in education and marketing. And while she enjoys writing in the fantasy and young adult genres, she is currently working on a dystopian novel aimed at adults. When I was 10, I started reading Little Women during my Christmas break from school. I continued to do so, every year, into my late teens. I loved the story and was very enthusiastic about the length—it’s very long (in case you’ve never read it). I loved the real life circumstances the book portrayed and fell in love with all of the characters. I could read this book over and over until the Apocalypse. Seriously. I love the romance that builds between two very different people, and courtship and romantic drama during the 1800s are quite fascinating. Being rude to someone by using clever language is a lost art form. I enjoy a good devotional every now and then, and this book is quite exceptional. If you don’t affiliate with Christianity/Catholicism, then it may not be for you, but I expect that deep thinkers and philosophical types would enjoy it as well. The book is very short (I think 120 pages or so? ), but it took me about eight months to get through—it’s that deep. This is an interesting take on Hell and/or Purgatory and Heaven. I used to teach through this book with my eighth grade students when I taught religion classes. The imagery is very well done, and come on: it’s Lewis for goodness sake. He really makes the reader think, and I love that. You like Medieval settings? Check. You want battles and gore? Check. Romance and suspense? Check. Amazing mythology with real-life hardship? Double check. This book begins a King Arthur series and marks the beginning of my life-long romance with fantasy fiction. I read this book in junior high, even though it’s an adult book. I am still just as in love with it 20 years later. So, so good. The best King Arthur mythology I’ve ever encountered. I actually like this book better than The Three Musketeers, and I love The Three Musketeers! I think the revenge factor and crazy plot twists are what made me become obsessed with this book. I first came across it in high school and read it one summer—just for fun. One of the best book discoveries I’ve ever had. You know those books where you go back and re-read scenes because you can’t get enough? THIS book was like that for me. A writer friend recommended it to me just this past summer and I fell in love! I am anxiously anticipating the third and final installment of this series, due out in January of next year. I hate waiting. I admit that my imagination can be twisted at times, which is why this is my final choice. Lord of the Flies is one of the very few “required reading” books I actually read in its entirety in high school. With me being an avid reader, lover of books, and a writer, you’d think I would have read all the assigned books. I shamefully admit that I hated most of the “classics” and read notes on pinkmonkey.com the night before my exams rather than actually read the books. But LOTF was a winner in my mind—and I read it from beginning to end! The corruption, the suspense, the gritty gore—I loved it all! It gave me chills as I neared the end and I enjoyed the thrill of the story. It only remains for me to thank Tamar for sharing her book choices with me and to wish her good luck with her writing and a cool Yule. Happy reading! I just love these posts, they are such an inspiration when it comes to finding new books I want to read. I’m glad you’re enjoying them, Masgautsen. Thanks for commenting. I missed this when you posted. Thank you so, SO much for having me, Paul! So much fun–love all the posts you’ve been sharing. Great idea. Cheers! Hi Tamar and thank YOU so much for sharing your choices on this blog.